It’s a safe bet many people bought or received a new smartphone or tablet for the holidays. Which ones did they get? That’s difficult to say for sure, but with some data from Chitika, we can get a pretty good idea. The company shared web surfing data through its ad network on more than 300,000 websites and found that while Apple(s aapl) still rules the roost, Amazon’s(s amzn) Kindle and Microsoft’s(s msft) Surface tablets were used quite a bit online as 2013 came to a close. On the phone side, only Apple’s iPhone saw a holiday surge of web surfing traffic, which suggests that a few new iPhone 5c and 5s handsets may have been under the Christmas tree. That “surge” wasn’t much of one though: iPhone users surfed the web 1.8 percent more during the holidays as compared to the non-holiday season. Still, the iPhone accounts for 54.3 percent of all web traffic in the U.S. and Canada as measured by Chitika. 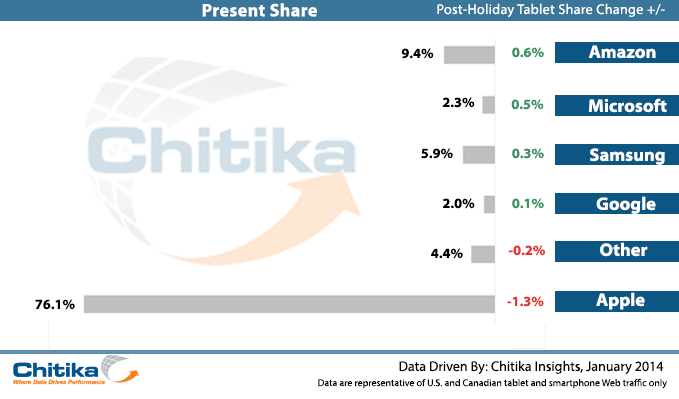 While the handset data isn’t that surprising, the tablet information is when you consider that Microsoft’s Surface products got a small holiday surfing bump and account for 2.3 percent of all web surfing based on Chitika’s data. That may not sound like much, but the data also shows that Google(s goog) Nexus tablet owners hold only 2 percent of the surfing usage. 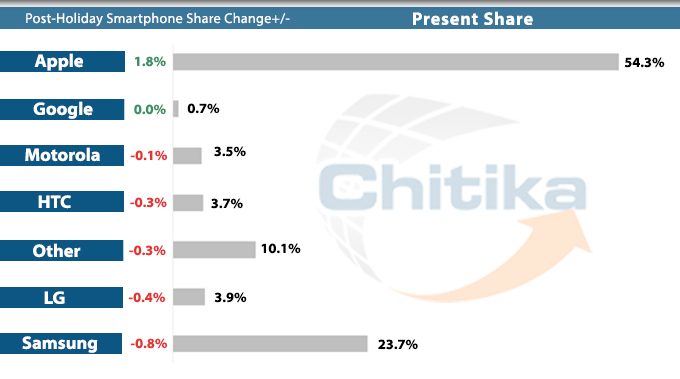 Microsoft appears to be catching up to web usage on Samsung tablets as well, which Chitika pegs at 5.9 percent. Among the Android devices, Amazon’s Kindle Fire is still hot. It saw a small 0.6 percent bump in holiday web surfing and holds nearly 10 percent of web traffic. While the Kindle Fire is rightly seen as a more limited tablet than typical Android slates, there’s something to be said for the device’s simplicity in its user interface and one-stop shopping for goods — both physical and digital — through Amazon. Apple’s iPad is the only measured tablet that actually saw its browser usage share decline over the holidays as compared to its competitors, but the tablet is still the top dog… by a vast margin. Chitika’s data suggests that more than three-fourths of all tablet-based web-browsing is still done on an iPad in the U.S. and Canada. Bear in mind that this data is simply a proxy based on a single ad network. Even though it’s a large network, the information doesn’t offer exact market share or phones or tablets. Instead, it offers a glimpse of actual usage to represent the market at large. This post was updated at 12:00pm PT to clarify and correct Apple’s tablet browser usage share over the holidays. The ACTUAL TAKEAWAY of this story is through Oct 2013, Apple has announced sales of 170 million ipads, since there’s hardly any growth with competitor tablets, we can extrapolate that there are @21 million Kindles, @13 million SAmsung, @5 million Surface sales. That pretty much explains why NO ONE outside of Apple has ever announced SALES numbers of tablets – even though Amazon can tell where and how fast the UPS truck delivering your batteries is – they cannot tell you how many kindles they have sold. Too bad they only count Surface in Windows 8 tablet use. Dell, Samsung, HP, Sony Lenovo all have tablet devices using Windows 8 or RT and probably add another very large portion. Windows 8 has over 10% of the market so far, and growing. Of Smartphone traffic or traffic from all devices? The graph says smartphone but your text implies all devices. Which is correct? Read in context throughout the paragraph, I think it’s pretty clear I’m talking about smartphones only as the graph validates. Incorrect, and badly so. The iPad’s usage undoubtedly continued its steady, years long rise in usage over the holidays. All the data shows is that usage of the iPad grew at a slower rate than the other tablets on the market. You need to rewrite that so it’s accurate. Thanks Jake. I think the addition of a clarifying phrase “saw it’s browser usage share decline over the holidays as compared to its competitors” will address that. I’ll make the correction. Spin it any way you must but the fact is these are “relative” numbers. Pretty certain Apple’s raw figures went up. Flood the market with cheap stuff and you water down the market leaders number and you end up with headlines and articles such as this. I’m not sure what the issue. Between the headline, the graphs and much of the copy here, nothing is pointing a doom and gloom scenario for Apple here. Yep, Apple saw a declineâ€¦. down to 75% with Amazon gaining all the way up to 9%. WOW, Apple is doomed. If this keeps up, in 10 years Apple will be â€¦. â€¦ well, probably still ruling the roost. Just a thought. Remember when Apple iPods sold 75% of the mp3 players in the World??? Well guess what, they still do. Even though mp3 players are selling much less, Apple is still ruling the roost. Somehow, I think iPads or what ever comes next will follow the same trend. M$ dumped a lot of old inventory at very low prices ( Microcenter on Black Friday had the RT with touch cover at 180$) but dumping inventory is not a win, or sales…. Good point and that may have had something to do with the holiday surge. I wouldn’t discount it though: More sales at or below cost may not make Microsoft any money but if it can boost market share and usage, it could attract more developer interest; I’d call that a win. Kevin, I am curious. Do you really think that people that only buy when something is really cheap, will spend money on apps and other things on their super cheap deviceâ€¦â€¦â€¦.. or will they just get super cheap / free apps????? And do developers want to spend time and effort developing for user that do not want to pay???? First thing, you lost your credibility starting your comment with M$. Nexus 2012/2013 tablets were heavily discounted as well for Thanksgiving( I know because I bought 2) . Note that Nexus devices has been selling originally with narrow margins and then discounted on top of it. You don’t care for that I presume. A Nexus 5/Nexus 7 user who is thankful of the low price and high quality. M$ with a dollar sign? In 2014? Dumping for market share? Oh you mean like what Amazon does with it’s Kindles. Remind me when was the last time Amazon ever made money.